Kelly Sonora at artcareer.net recently notified us of a list of the “100 Awesome Niche Photo Sites You’ve Never Heard Of.” The categories include organizations, photojournalism, outdoor and travel, wedding, event, and portrait, fashion and commercial, science and medical, fine art, education, DIY, business, technique, Photoshop, resources, photography law, and gear. Other lists at the site include 100 free, essential web tools for digital artists, 100 must-see art blogs of every form, and 100+ awesome open courseware links for artists. 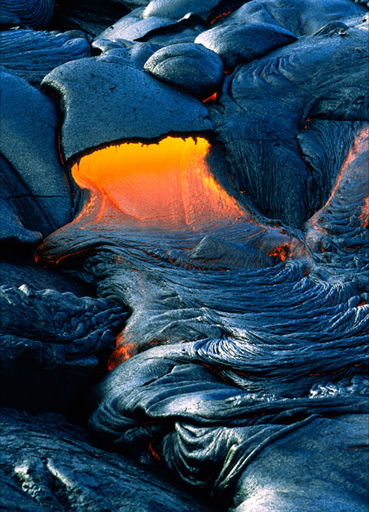 Photograph by Marc Moritsch, from a display of “Patterns in Nature: Lava” at National Geographic. The terrorist attack in Mumbai may have been unusual in the scale of the assault and the firepower involved, but it soon was folded back into a familiar succession of images: smoke and fire billowing upwards from tall buildings, trapped individuals looking out of windows for help, soldiers and other emergency personnel converging on the scene, survivors being taken to hospitals, . 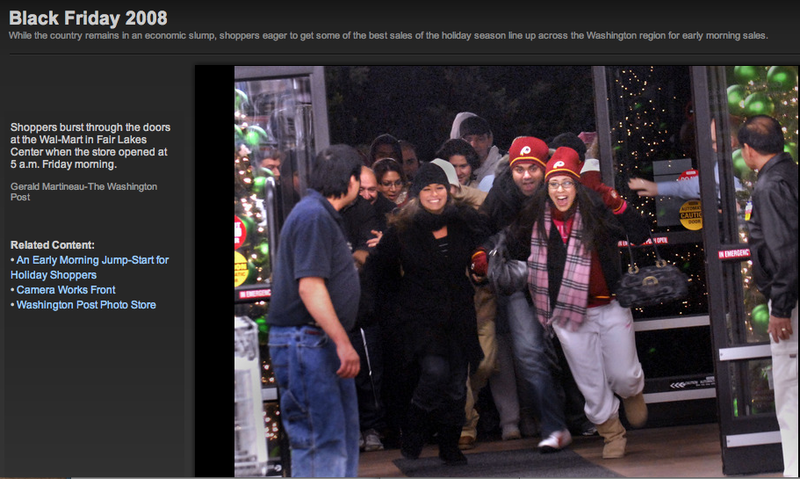 . . and then images of assailants, victims, grieving families, and candlelight vigils. Now, as the attacks slide into the past for most of the world, we are left with shots of the physical destruction and initial efforts at restoring a sense of normalcy. These, too, are conventional, but I found two of them to be deeply evocative. You are looking at a room in the Taj Mahal Palace & Tower Hotel in Mumbai. By peering into the rear of the picture, one can pick out security personnel, but they might as well be receding into the vanishing point. This image is the portrait of a room. More precisely, of the wreckage of what was once a room but now has been reduced to space and debris. There is something at once majestic and terribly sad about this ruin. The alternation of light and shadow could be the work of an Old Master, but that aesthetic reclamation only underscores the pathos of other human work having been torn down. The large fixture now laying on the floor near the center of the frame is a globe within a globe–the fitting symbol for how a hotel becomes a small world within the world of the city, itself a sphere within the human cosmos. Terrorism, like its older brother War, tears down worlds. One small irony behind this poignant image is that the decor of the room before the attack might have struck one as garish or otherwise not to one’s taste. We can afford to be discriminating and judgmental, or inattentive and unappreciative, when things are not disrupted by violence. Amidst the wreckage, we are confronted with larger questions of loss, and so of what really should be loved. This is an interior view of Nariman House, maintained by the Chabad Lubavitch organization. This image of the devastation caused by combat is perhaps even more disturbing than the one above, as it hits closer to home. Instead of the scale and decor of a grand hotel, we see the small spaces and frame doorways found in houses and apartments. Instead of a massive fixture for a public space, we see bedding and a broken bedframe, and, on the right, even a roll of toilet paper untouched by the carnage. The cumulative effect is awful. In place of what had been a familiar simplicity, there now is only an ugly mess. What should be a place for rest, repose, and taking care of the self, and for dreams, love, and creating a life with others, has been trashed, torn apart, violated. Terrorism is one of the seeds of war, and like all war, it makes a mess of the world. What takes years of commitment, creativity, and effort can be ruined in minutes. 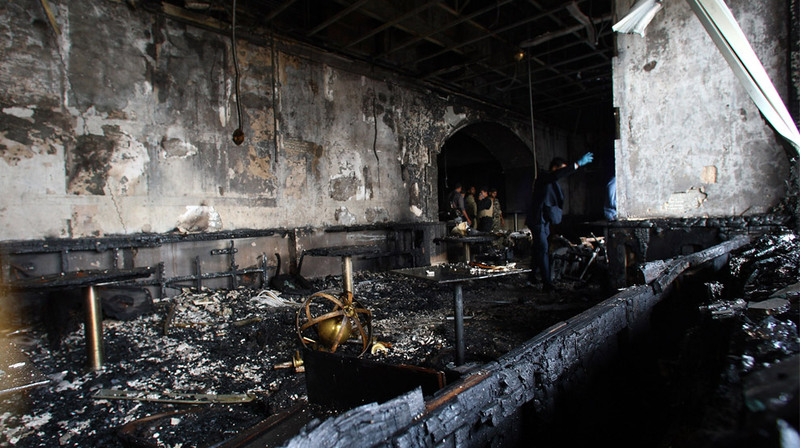 These photographs of devastation remind us that war doesn’t just kill individuals, although that is horrible enough. The real target is civilization itself, that is, the built world that sustains communities, commerce, art, science, politics, friendship, families, and everything else that people find necessary for human life. 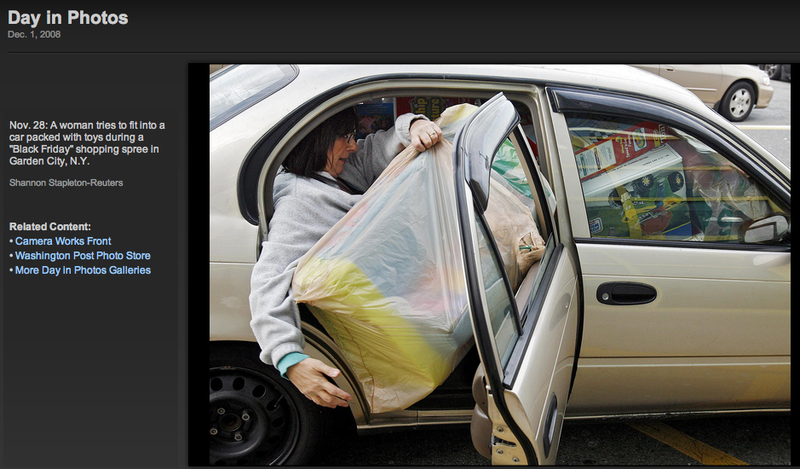 Photographs by Julian Herbert/Getty Images and the Associated Press. Much has been made recently of comparisons between the Great Depression of 1929 and the current economic crisis all the way to the point of framing President-elect Barack Obama as the twenty-first century’s FDR. Only time will truly tell if the analogy will be borne out (no pun intended), but there are good reasons to be skeptical. 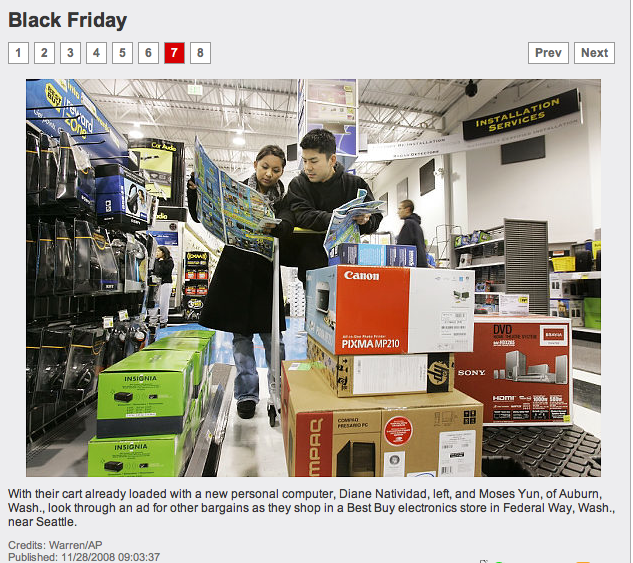 The photograph below is one of a number of similar images that appeared in on-line stories and slide shows at a number of major newspapers this past weekend, reporting on “Black Friday”—the so-called “traditional” beginning of the Christmas shopping season. The difference, of course, is stark and pronounced. 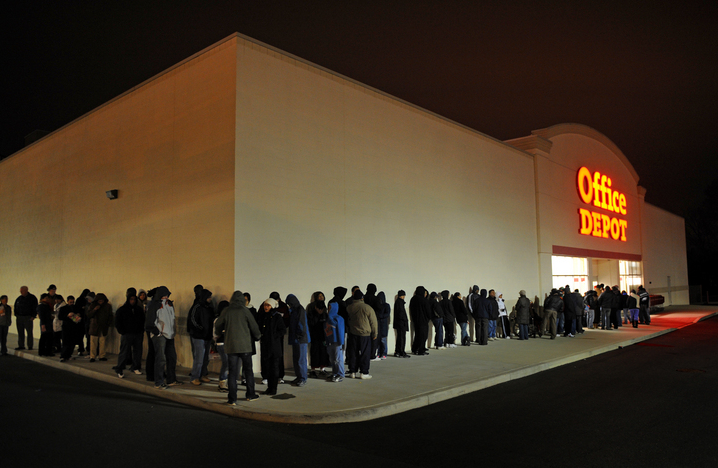 Then unemployed citizens lined up for free food (provided by civic organizations of one sort or another) to satisfy their most basic physical hunger; today we line up as consumers to purchase mass produced items (provided by global capitalism) that satisfy a different, fundamentally psychic hunger. 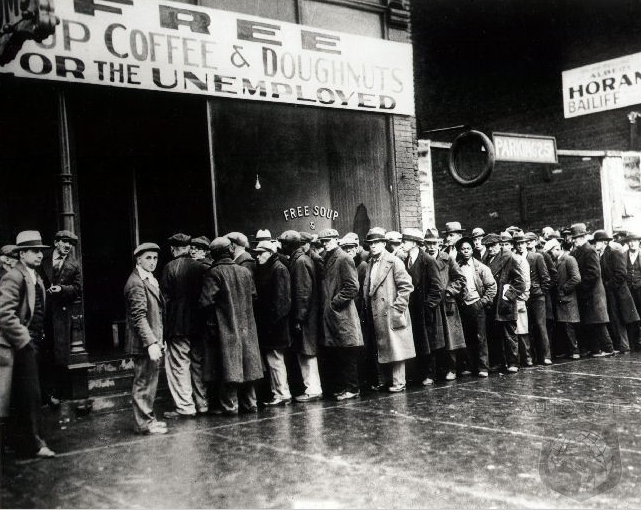 Then the government developed public works projects designed to enhance our national infrastructure and to provide employment for those most in need; today the government pumps hundreds of billions of dollars into the economy in order to “ease credit markets” (its own version of the “Blitz Line Starts Here” sign) and to encourage consumption. And we are surprised when citizens accumulate debt by spending on credit rather than saving for a rainy day—or worse, trample and kill fellow citizens to purchase luxury items. Indeed, we actually wonder how we got into the current economic crisis. It may well be too late to turn back the clock to a time when being a good citizen and being a good consumer were separate identities, but if the soon-to-be President Obama is to live up to the comparison to FDR he is going to need to help Americans to understand the difference between the two, as well as the implications for our national character of the relationship between Black Thursday and Black Friday. Sight Gag: "And they say he is a lame duck president!" Guest post by Aric Mayer. Over the past three generations, the volume of images casually generated out of family life has increased exponentially. From the early 1900s when the Brownie camera made photography something that can be practiced easily, families have made records of important events and people, hoping perhaps to create traces and artifacts that can bind the past into the present, keeping time from marching away. There is also the strange paradox that occurs as we stage current events in order to photograph them so that we can look back at a future time and see them again. We perform for a future audience of our selves and our friends, rewriting history as we live it. As film and now digital technologies have developed, the ease and number of these types of images has gown. It is hard to know what the final impact of this flood of visual information will be on the next generation. Exactly eighteen months ago my wife gave birth to our two children Laszlo and Chloe. In our short year and a half as a family there is already the sense that time and events are forever passing—the first tooth, the first steps, the first words … every week seems to bring another first, and with it comes loss. The temptation is there to record everything, to make an effort to translate life into a document that we can hold and thereby inoculate our selves from the losses that time brings. That would be impossible, of course, but it doesn’t stop me from trying, as in the process I have accrued 20,000 photographs of our personal lives together. I recognize that when I am photographing, I am not simply recording events, but rather am converting them into frozen dioramas that do not necessarily recall the moments that they come out of. It is entirely possible to make a beautiful picture in the middle of crying and chaos. Likewise visual chaos can be made out of the mundane. The photograph above is one of my favorites. Laszlo is drawing on paper. Chloe is drawing on Laszlo. And I am converting the scene into an image that frames them in that moment, creating a drawing of my own. 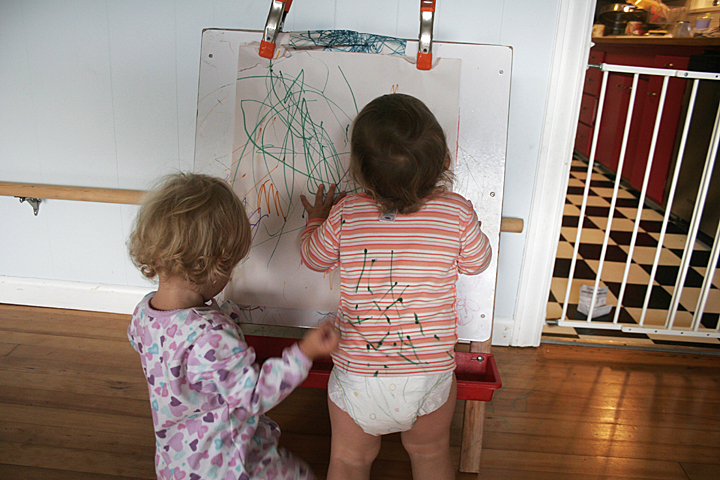 It speaks to the multiple ways that we as families leave un-erasable marks on each other at so many levels. The taking of family photographs is not simply a way of stopping time or recording the present for future consideration. It is also a way of organizing how we see ourselves. After a day with my children, I still on occasion set up a slideshow on my computer and watch my photographs from that day for half an hour or more. Even though I was with them in person for the day, the photographs bring something different than our relational interactions. These images are also about me. Not in a narcissistic sense, although we must be careful how heavy handed we are in shaping our children’s images of self. These pictures contribute to how I see them and to how I organize my understanding of their place in my life. Included are pictures of the crying, scrapes and bruises, bad days, the other half of the picture. It is an intensely personal body of photographs. And by the time my children are in their early twenties, they will inherit hundreds of thousands of these images. Along the way I will select a few thousand that stand out for me. Who knows what these will mean to them? What will we even do with such an amount? Editors Note: The National Gallery of Art hosted a show titled “The Art of the Snapshot” in 2007. I have written previously about the regularity and profusion of photographs of children in the Middle East—Israeli, Pakistani, and Iraqi children in particular—playing with toy guns. Such images operate in a somewhat allegorical register as they invoke one or a number of ironic, dialectical incongruities between child and adult, innocence and maturity, play and reality, the pleasure and horror of war, plasticity and steel, “their” present and “our” past, and so on. This photograph seems to capture all of that and something more. 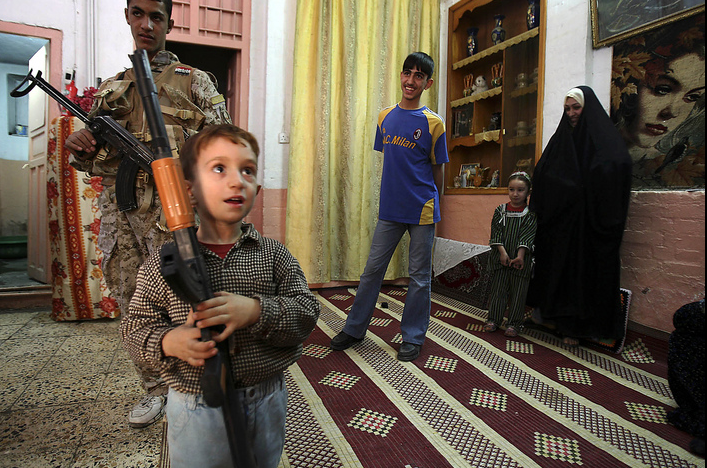 The caption reads: “An Iraqi boy holds a toy gun during a joint American and Iraqi military security sweep in the neighborhood of Sariyah in Baghdad, Iraq.” The key to the image, however, is in recognizing that the toy gun is incidental to the scene that that we are witnessing. The boy holds a toy weapon, to be sure, but he does so awkwardly as if he doesn’t quite know how to use it, and in any case he does not hold it in a manner that might be thought of as threatening—or even effective. Nor is it the toy itself that draws the viewer’s attention—the caption to the contrary notwithstanding—but rather the young boy’s gaze. But what could he be looking at? What does he see? And where have we seen this image before? Of course, we cannot know for sure what he is looking at. But the soldier standing behind him is Iraqi, and the boy is clearly not looking at the photographer, who is positioned at an oblique angle to the field of vision. Given that the caption identifies this is a joint Iraqi-American “military security sweep” it stands to reason that the boy has fixed his gaze upon the American soldier—or at least that is what the interaction of image and text invites us to imagine. And what he sees there is clearly something that pleases and inspires him. Indeed, it is the look of a child’s wonder, perhaps even hero worship, as if in the presence of a powerful and incorruptible majesty. One might discount it as the misdirected gaze of youthful innocence and naiveté but for the fact that the family members in the background giving their smiling approval to the scene that unfolds before their eyes as well. The young boy’s gaze is not new to us, at least not to those of us who were raised with the myth of the American west, where physical strength and a skill with six-guns (and the resolve to use both when necessary) served as individual virtues necessary to taming an otherwise dangerous frontier and to making the world safe and secure for democracy and domesticity. 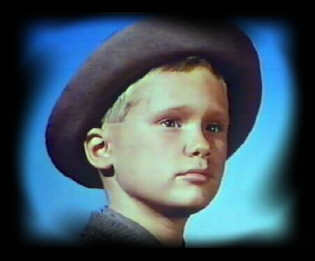 Indeed, the boy’s gaze almost perfectly mirrors the look of Joey Starrett in the 1950s western Shane, the young boy (played by Brandon DeWilde) who worships the title character—a somewhat mysterious stranger with a gunslinger past that he is trying to forget nevertheless draws upon his strength of character to save the homesteading community from a brutish cattle baron—for precisely these virtues. At the end of the movie, after having completed his work, Shane moves on, even as Joey cries “Shane! Come back!” for he knows that there is no place for him in the world that he helped to make safe. The most insightful essays on photojournalism typically have included keen attention to the social and political implications of the photographic technology itself. The ideas and attitudes that become influential often persist despite technological change–sometimes rightly so, but not always. One item of conventional wisdom that needs to be either updated or shelved is the anxiety about media spectacles. We don’t see what they are seeing, but we do see how they are seeing it. Clustered together on a busy city street, focused as one on the small screen, blending their distinctive reactions, these strangers have become civic friends for a moment though an act of shared spectatorship. The remain individuals with distinctive modes of response–curiosity, pride, studiousness, and wonder, and with that four variations of a good feeling–but they obviously have been pulled together, however briefly, as if they they had other things in common as well. Though still strangers, they are also citizens defined by their comfort with each other while looking together at one sign of political representation. It is significant that we see only her camera, not the picture taken. The content of the image does not matter as much as the fact that she can take it and share it. This everyday event thus reflects major social realities: it is understood that no guard is going to come along and confiscate the camera, that people can interact casually on the street as equals, and that the photograph typically is taken to be shared. It also is evident how digital technologies are inflecting the conventions for taking and interacting with images: cameras are everywhere and no longer tied to special occasions such as travel, the photograph is immediately available for review and other use, any place is a suitable place to view the image, and it could end up just about anywhere. The passers-by can look over her shoulder because they all have already done something like that many times before. Indeed, one consequence of affordable cameras and especially of the ubiquity of digital cameras may be that they prompt and normalize interactions among strangers. Whether asking someone to take your picture to holding up the camera phone image for all to see, one is crafting a public in miniature. It also may be significant that the image is so small. Although the viewers’ reactions suggest an aura of political authority, the camera is also cutting it down to size. Likewise, the phantasm of Big Brother on the giant screen dominating all consciousness is seriously out of place here. There still are big screens, of course, and billions of dollars poured into major media productions, but digital technologies also are radically democratizing visual culture. In place of the mass media spectacle, there are small moments of shared seeing. To understand that well, we need to get beyond high anxiety about the media spectacle. Less attitude and smaller concepts doesn’t sound like a prescription for academic stardom, but it might be just what is needed to understand visual democracy. 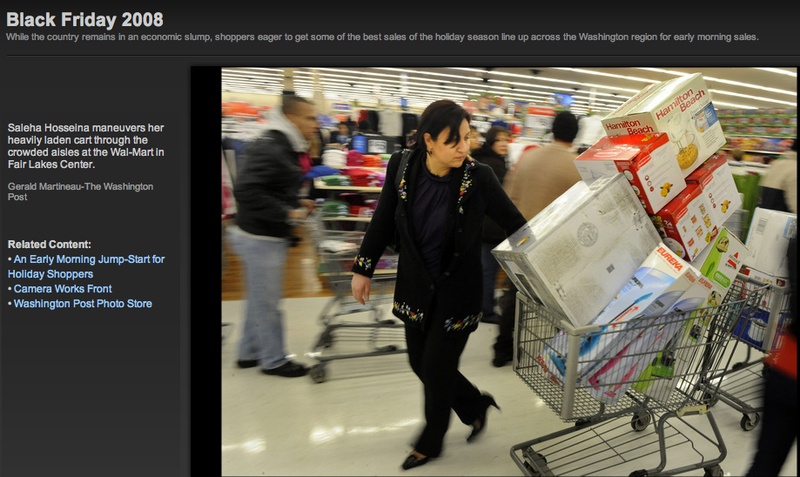 Photograph by Ozier Muhammad/New York Times. 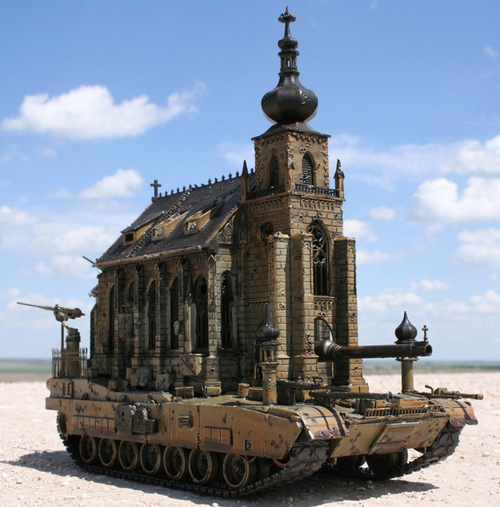 Credit: “Church Tank” by Kris Kuksi. In the early twenty-first century, the still photographic image continues to be one of the central visual technologies of humanitarianism: from the all-too familiar images documenting successive waves of famine and disease, through those that bear witness to the action and destruction of war, to the photo ops staged in the arena of struggles for human rights. 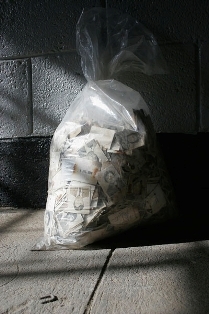 Disseminated across a range of media and spanning geographical distances and cultural divides, photographic images are presented for everyday consumption, produced by practitioners often working explicitly in the name of ‘humanity’ and testifying to acts of injustice and states of destitution and abjection. And yet: this humanitarian deployment of photography has been vigorously attacked from a variety of angles. The contemporary moment is plagued by anxieties concerning an oversaturated visual sphere and attendant compassion fatigue, a state of anaesthesia said to blunt the photograph’s political and ethical efficacy. Humanitarian photography is predicated on humanist principles even after more than half a century spent interrogating and deconstructing the discourses of humanism. Within photography theory, not only have there been sustained attempts to dismantle ontological notions of photographic reference, but documentary has been pilloried as a practice that is profoundly implicated in the perpetuation of liberal capitalism. Despite all this, however, the fact that photographic images of human suffering, deprivation and also resilience continue to circulate and be deployed suggests an ongoing belief in their power to affect and ultimately to effect change. ‘Humanising photography’ is a single-track conference that aims to establish a creative forum in which to reflect on the political, ethical, historical, and aesthetic questions thrown up by the persistent presence of such images in the context of humanitarian discourses. It will bring practitioners into dialogue with scholars working in the academic fields of visual culture studies broadly construed and representatives from humanitarian organizations. Whilst we welcome papers exploring salient contemporary issues and case studies, we especially encourage those that examine other contexts and histories that have been occluded in the contemporary geopolitical moment, in addition to theoretically-oriented reflections. What modes of humanist photography might still be valid in the twenty-first century? What are the histories of humanist photography? What are the tropes, figures and other rhetorical devices at play in such photography and what are their effects? What is the political and emotional work that is done by this mode of photographic display and does it work? What are the modes of appeal of such images, whom do they address and on what terms? How do the modes of circulation and display impact on modalities of affect and effectivity? Please send 500-word abstracts for 30-minute conference presentations and a brief biographical note (maximum 5 lines), together with affiliation and contact details to: photo.group@dur.ac.uk. Deadline for abstract submission: 19 December 2008. Notification: by 5 January 2009. The wildfires burning around Los Angeles this week were so hot that they could melt steel. 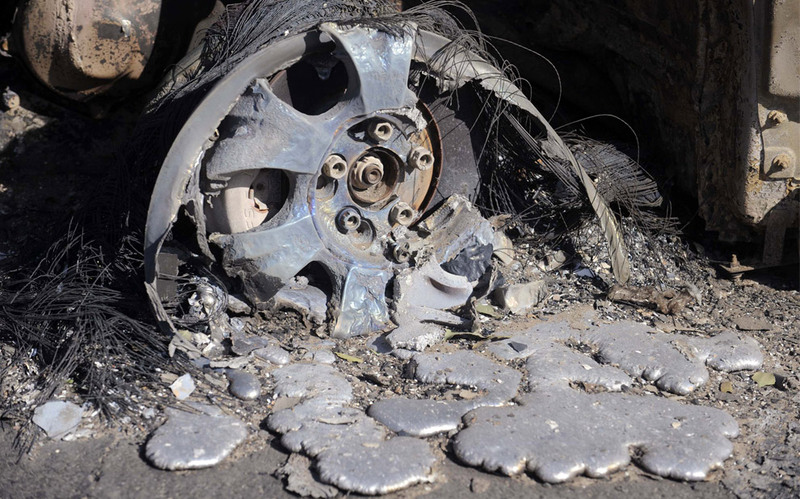 Here a wheel rim has puddled into globs of dull metal. It’s as if the vehicle were being smelted back to its original elements, reversing the long process of civilization that turned iron ore into a truck. The fire might have been started by a match stick–or, more likely, a random lightening strike, one among thousands that happen in the area every year–yet it can become a raging inferno capable of devouring cities. In the aftermath, green shoots will appear amidst blackened devastation and the great cycle of life will continue. But nothing there will put that wheel rim back together. Nature, it seems, is no respecter of machines. 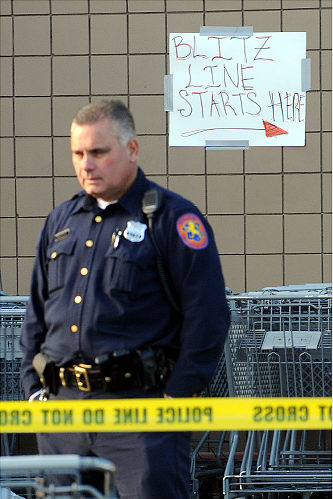 The image is a color photo, of course, and that makes the point all the more poignant. The gray metal isn’t an artifact of the photographic process. Instead, a color print reveals how gray has flowed into view. What had been hidden behind chrome has been released into the environment like lead or some other industrial toxin ready to leach further into the landscape. What had been crafted to help a society hum along now is neither artifact nor nature but that third thing: waste. Again, a color photo reveals a world turning gray. It actually took a moment for the colored shirts on the Iraqi police officers to assert themselves into my focal vision, rather than merely providing a felt and uneasy sense of contrast. 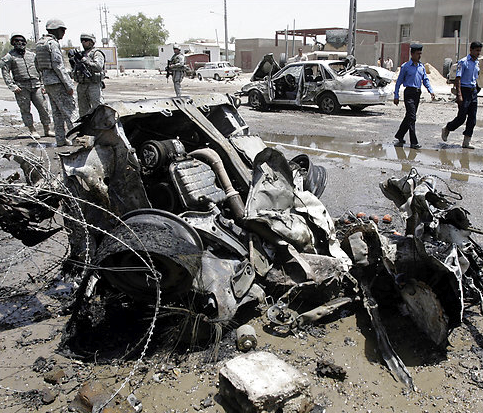 The wreckage from a car bomb dominates the foreground of the picture and is reinforced by the second smashed vehicle in the center rear. The scene as a whole is tonally consistent with these gray/white wrecks. But for one taillight and other minor reddish hints, this is a world of grays, greens, and other dull surfaces. 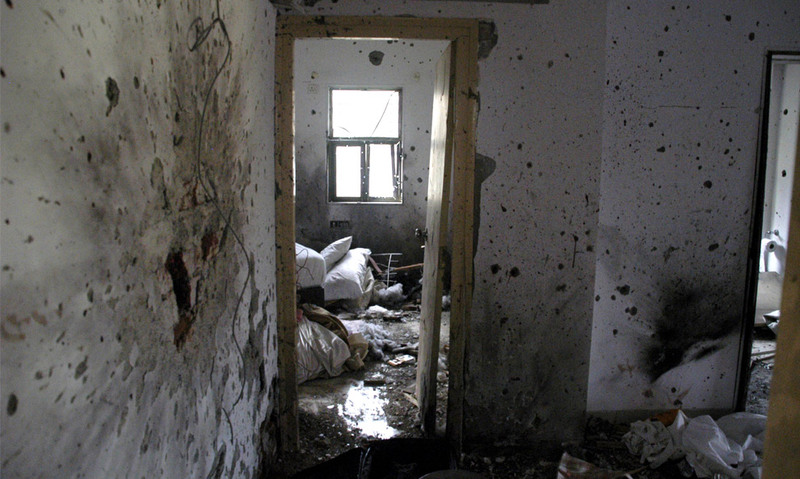 Whether war zone or concrete yard, it’s a world being given over to gray. No wonder the police seem out of place: colorful, nonchalant, they imply domestic peace and all the life that can be a part of that. They are balanced and then some by the soldiers opposite them, who seem more of a permanent fixture. By contrast, the police are just passing through. People like to think that wars, like fires, are accidents; and that fires, like wars, could not have been prevented. In reality, the California conflagrations are predictable outcomes of poorly regulated housing development. And the war in Iraq–well, we know that story, and it was no accident. The truth is that for all the art and energy that goes into building up modern societies, they also carry within themselves powerful forces that are continually turning people, places, and things into waste. Alongside familiar scenes of peace, prosperity, and color, another world is also under construction: Gray world, inert yet dangerous, making waste seem like second nature. Photographs by Phil McCarten/Reuters (thanks to The Big Picture) and Karim Kadim/Associated Press. Note that because NCN doesn’t have a style sheet or a copy editor to keep my erratic spelling in check, I use both “gray” and “grey”; something I learned, somewhat to my embarrassment, when I searched for the Shades of Gray post and turned up more entries under “grey” than “gray.” Both terms are correct, but consistency would still be a virtue were it to be found here. For that, readers will have to look elsewhere.